33 years ago I decided to build a big horn system. Constructed in the dorm library over Christmas break, the result was dubbed The Claw, a straight exponential horn 9 feet long with a 42 Hz expansion curve and a 50 sq ft mouth. We mounted a JBL LE15A woofer in the throat and used a JBL 375 compression driver and horn for about 500 Hz on up. No matter where we pointed it, the cops showed up every time. 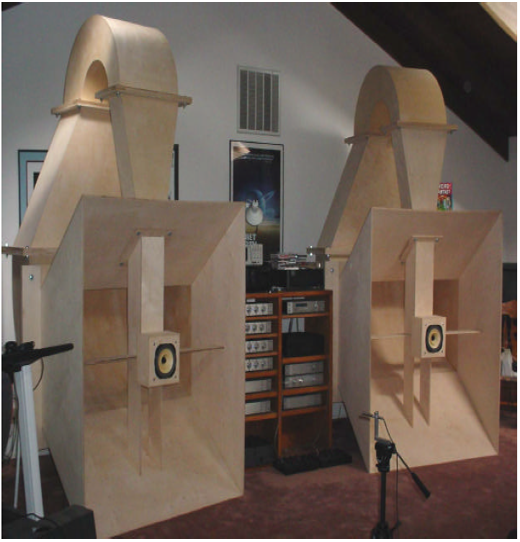 I've always wanted to build a stereo pair capable of even lower frequencies, and these days I am fortunate enough to have a 12,000 cubic foot listening room isolated from civilization. This summer I was also graced with the help of a twin pair of engineering students, Chris and Matt Williams, eager to build something cool. So we tackled a set of big exponential rear-loaded horns. They are named KleinHorns as they vaguely resemble a drawing of a Klein Bottle, a 4th dimensional container whose inside is the same as the outside. Perversely, Klein also means little in German. Horns vaguely resembling this project have been around for many years, but I believe at least the name is original. A horn is an acoustic transformer, changing high pressure and low volume at the throat to low pressure and high volume at the mouth. It does so by slowly expanding the cross section of the tube down which the sound wave travels, and it creates an acoustic load for the driver as if it had a very large diaphragm, dramatically raising its efficiency. A horn loudspeaker is characterized by several numbers; the area of the small end known as the throat, the wide end known as the mouth, the distance from the throat traveling down the length of the horn toward the mouth, and the expansion curve of the cross section of the horn as you travel that distance. 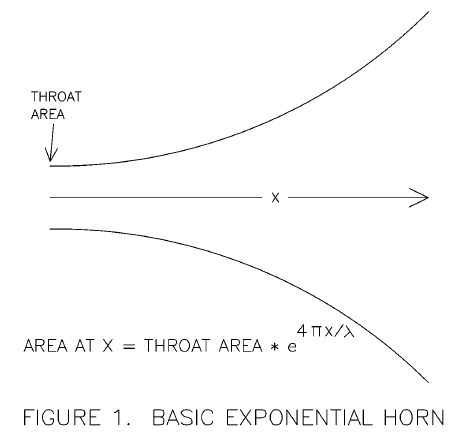 In an exponential horn, this expansion is given by the initial throat area multiplied by the natural logarithm e raised by a power factor related to the distance down the horn and the lowest frequency we want to work at. We are very interested in the lowest frequency that the horn will work its transformation. 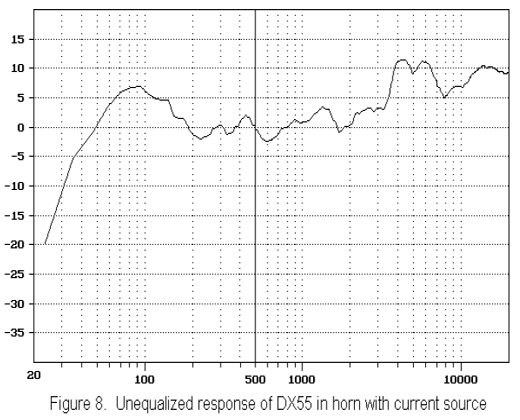 The lower cutoff frequency is where the horn no longer "amplifies" effectively, and for an exponential horn generally the horn will be usable down to 1/2 octave above this point. In Fig.1 shows a picture of these elements and the formula giving the desired crosssectional area, which is proportional to e (2.718) raised to the power of 4 * pi times X inches divided by lambda, the wavelength of the cutoff frequency. The Kleinhorn is designed around a cutoff frequency of 30 Hz, which gives a wavelength of 440 inches (13,200 inches/second times divided by 30 /second = 440 inches). The value of the exponent is 4 * pi * X / 440 which equals .029 times the length X in inches. As a practical matter, we can look at this as how many inches it takes for the cross-sectional area to double, which for 30 Hz is 24 inches. This figure is inversely proportional to the frequency, so that for 60 Hz, the area doubles every 12 inches. In order for the acoustic wave to be transformed, the length of the horn should be at least 1/4 the wavelength of the cutoff frequency, which is this case is about 9 feet. Also the mouth of the horn needs to be sufficiently large, its area wanting to be about the same as a circle with a diameter about 1/3 wavelength, in this case about 12 feet, with an area about 117 square feet. This formula is for horns operating in free space, which will not be the case here. For practical reasons, the Kleinhorns will each have about 30 square feet, between them only 1/2 that area. Assuming essentially monaural signal at 30 Hz, we can get away with this because the horns will be sitting on a floor and near a wall, creating something resembling 1/2 to 1/4 space which will give us some acoustic boost at the lowest frequencies. In actual measurement we see that in a large room this horn will give us usable transformation to about 40 Hz, which is what we expect. As we make the horn mouths smaller than the wavelength of the lowest frequency, we start seeing curves that resemble figure 2, an actual horn curve. Here we see the free air response of a horn with a mouth with a diameter much smaller than the wavelength of the cutoff frequency. The output is still transformed, but becomes resonant and irregular and loses amplitude at a much higher frequency that the taper. Because most horns, including the Kleinhorns, are compromised to some degree in this fashion, it is popular to place them against a wall, and in more extreme cases, in a corner to boost the acoustic loading at the lowest frequencies. As a practical matter, it is difficult to find the space to place a straight horn whose length has to be at least 10 feet, and so we look to fold the horn into a smaller space. In addition because this is a rear-loaded horn intended for single driver system, we want the mouth to come out more or less pointed at the listener. So we bend the horn to achieve both these purposes. In an ordinary duct, when we turn a corner 90 degrees we will experience roughly 8 dB attenuation when the dimensions of the duct are comparable to 1/2 the wavelength. For this reason we want to avoid sharp turns, and you will see in the Kleinhorns that we try to gently ease the wave around curves when a bend is necessary. Also as a practical matter, it is not easy to construct a nice smooth exponential horn with a circular cross-section. 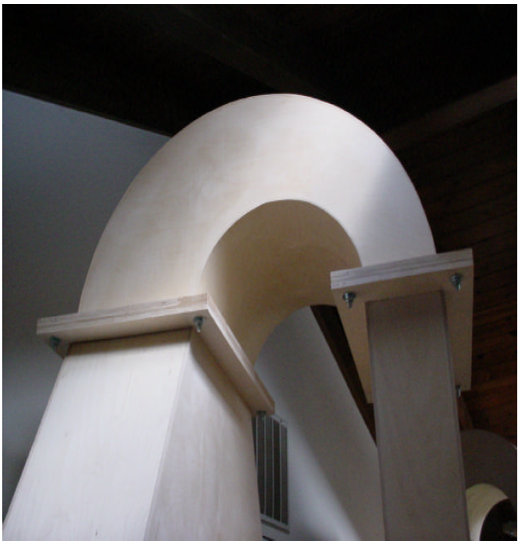 Amateurs at wood working at best, we chose to use a rectangular cross-section and break the horn into 6 segments, each having two parallel walls and geometric conical expansion. This way we have no complicated wood cutting, and the horn can be fit through an ordinary door. Fortunately, horns don't have to be exact to work well. A horn that is fairly close to an exponential expansion over its length but piece-wise has sections with a conical expansion works nearly as well as an ideal horn. Because we have some parallel surfaces over the length of the horn, we will encounter some minor standing waves that would introduce some additional irregularities in the response. Figure 4 and 5 show the Kleinhorns from front and side. They were fashioned from various thicknesses of Baltic (Russian) birch plywood, void free, more dense and with thinner and more numerous grain-aligned laminations than regular plywood. Very nice stuff. The dimensions are in inches, and each curve is circular, with the radius shown. At each junction you will see the dimensions of the cross-section. From the drawings you will notice the flanges at the end of each section that mate it to the adjacent piece with 1/2 inch bolts. 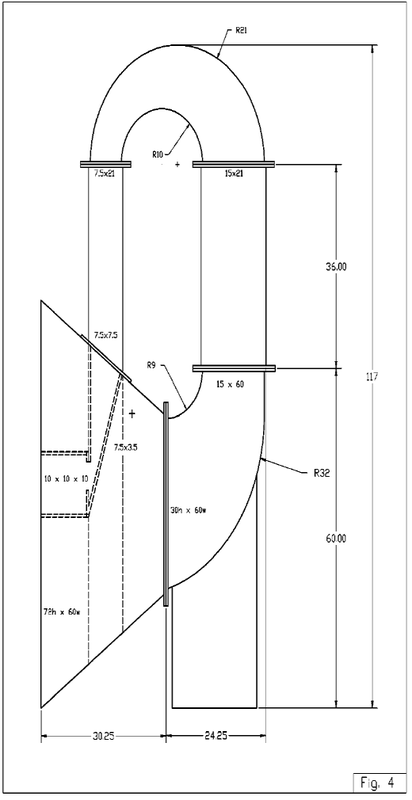 These drawings are intended as guidelines, not blueprints. Use the materials you prefer, and feel free to improvise. When we consider the effects of bending, parallel surfaces, and mouths that are slightly small, there will be a number of irregularities to smooth out. Toward that end, we will look to some acoustic filtering and damping to smooth out the response and filter out the higher frequencies going down the horn. Being a rear-loaded speaker, we want the response of the horn part of the loudspeaker to pick up where the low frequency response of the driver starts to fall off, and we want to remove horn frequencies higher than that. The box in which we mount the driver acoustically behaves as a capacitor. Properly stuffed with absorbent material, it attenuates the higher frequencies off the back of the driver before the throat of the horn. The Kleinhorn was designed to have a modular approach to this box, allowing for different size rear chambers to be bolted onto the throat of the horn and easy access to the stuffing, so that the filter value can be varied. The second treatment used to control resonance is to also fill the interior of the horn itself with absorbent material. This is done starting at the throat and moving toward the mouth. The amount of stuffing and its density is determined experimentally. Currently I have the front vertical part of the horn stuffed up to into the top arch. Sheets of absorbent material (in this case, carpeting) covered parallel surfaces in the rear vertical section. The mouth surface was left undamped. Listening tests were the criterion used to decide on the dampening. I started with the speaker box and then worked from the throat to the mouth, applying stuffing and absorbent sheets and listening to the results. In the end, I tried absorbent material on the parallel walls of the mouth area, but removed it, preferring the sound of the uncovered wood. At the time of this writing, I am still playing with the damping. We go to all this trouble obtain the best performance from a high-efficiency full-range driver, such as the Lowther DX55. This is an extremely well made and potentially very excellent sounding driver, but its small size, light moving mass and very efficient motor do not make for much in the way of bass response. 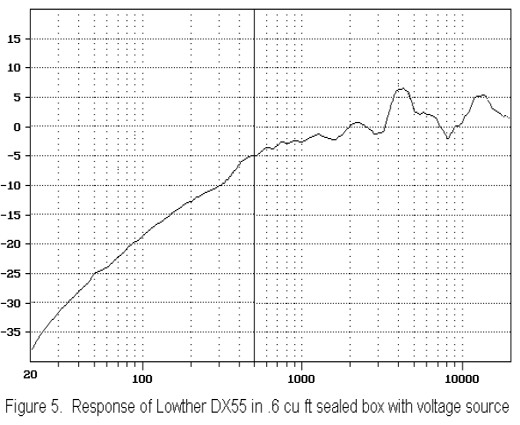 Figure 5 shows the response curve of this speaker in a small closed box, which is not much different in a large closed box. Figure 5 also indicates why this driver is most often found in rear loaded bass enclosures and not sealed boxes. In figure 5 we see the near field of the speaker measured with a 5 kHz bandwidth up to 500 Hz, and this curve is joined by the normalized response taken at 1 meter with a 25 kHz bandwidth above 500 Hz. The curve has been smoothed to 1/3 octave. 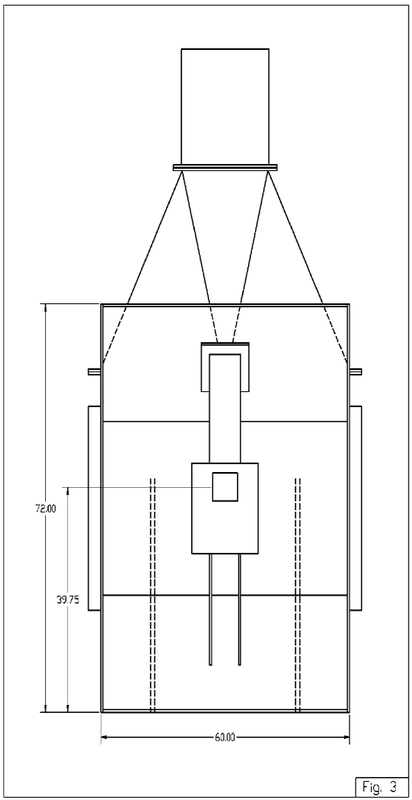 In Figure 6 we see the DX55 in a .6 cu ft box mounted to the throat of the horn. This curve is the combination of a curve with a 5 kHz bandwidth below 500 Hz, and a 25 kHz bandwidth above 500 Hz, both taken at a distance of 6 feet. Again the curve is smoothed at 1/3 octave. 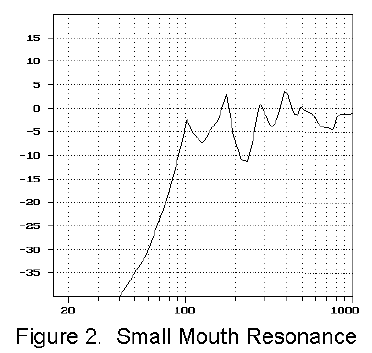 We cannot take a near field figure for the horn, as the operation of the horn sets conditions where there is near zero pressure but high volume at the mouth, and the pressure does not develop until you get about 1/4 wavelength away at the lowest frequency, so it was measured 6 feet away, which allows measurement to about 40 Hz. It is difficult to separate the contributions of the front and rear, but using the data from Figures 5 and 6 I estimated this and drew two lines showing the approximate relative outputs of each. 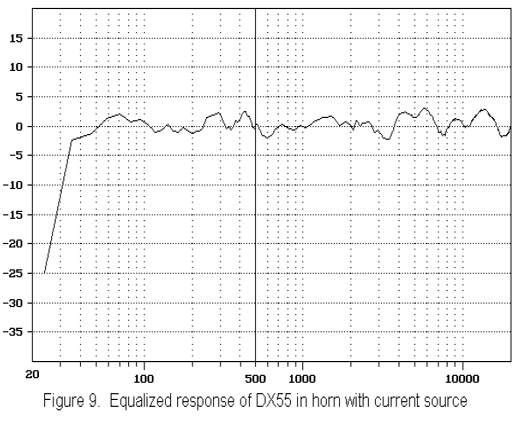 We infer from this curve that the horn increases the bass energy by a factor as much as 20 db over its operating range, which is the difference between 1 watt and 100 watts. In this case we detect a bit of a lapse between the two between 100 and 200 Hz. This can be improved with a smaller box or with part of the equalization that I intended to apply. Trying both, I found that I preferred the original box and equalization, finding that it was better to limit the bandwidth of the rear horn to a lower frequency to minimize the effects of the substantial delay through the length of the horn. Figure 7 shows the same conditions as Figure 6, but with a parametric equalizer used to correct the response curve. It was possible to equalize the curve a little more dramatically to make it flatter, but I found that it didn't sound as good – it was described by one listener as "sucking the life out of the music", and so I actually ended up preferring the sound of curves which were not as flat as this. 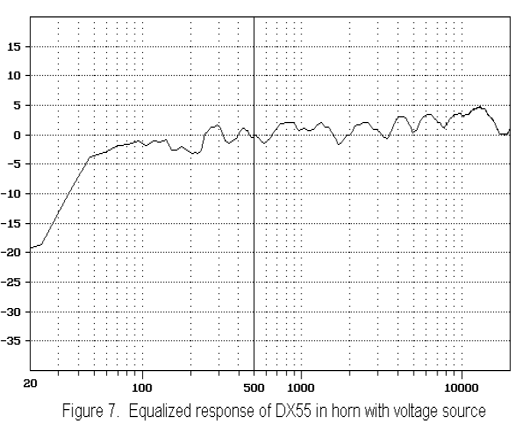 I also tried driving the DX55 in the horn with a current source having an 80 ohm output impedance and got the curve of Figure 8. 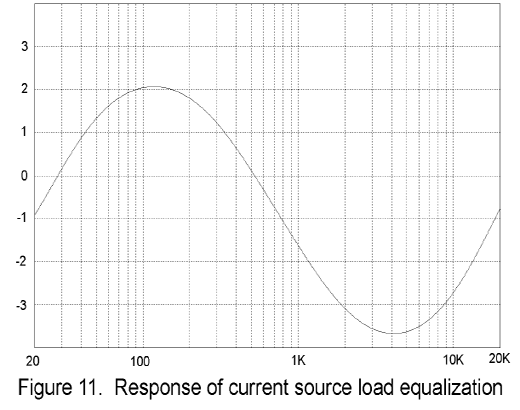 It is considerably flatter than the curve of Figure 6, as the current source delivers more power at the bottom end where the impedance of the driver shows its fundamental resonance at about 90 Hz. Unequalized, this system sounds fairly good by itself, particularly if you are off axis about 20 degrees or so. Again I applied parametric equalization, although less of it, to the system to obtain the flatter curve seen in Figure 9. The results were subjectively better than those of Figures 7 and 8 - I speculate that both the current source and lesser equalization contributed to this effect. Encouraged by the current source performance, I worked up a passive "Zobel" type parallel loading network to smooth out the curve of Figure 8. 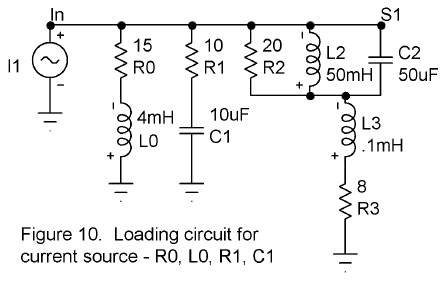 The resulting circuit is shown in Figure 10. In Figure 10, the current source has an 80 ohm source impedance (that of the First Watt F1 amplifier), and the speaker impedance is represented by the components R2, L2, C2, R3 and L3, which models the DX55 in the Kleinhorn. 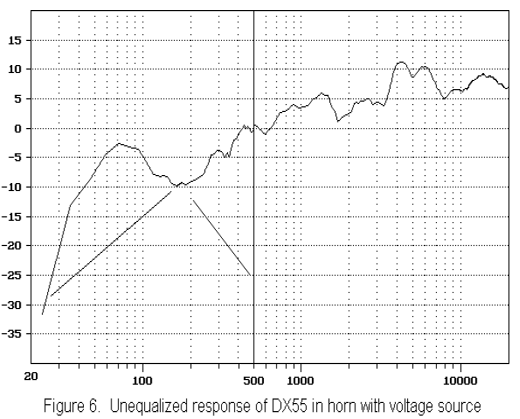 R2 would ordinarily be the 90 ohm value for a DX55 in free air, but the horn acoustic resistance damps this resonant circuit down, so that a 20 ohm figure is closer to reality. The loading network is seen as R0, L0, R1 and C1, and the resulting voltage across the driver is seen in simulation in Figure 11, and the measured output is seen in Figure 12. The circuit of Figure 11 and curve of Figure 12 sounded significantly better than best previous result, that of Figure 9. It had a livelier and more musical character, and became the reference system. As before, this curve was taken at 6 feet on axis, with 1/3 octave smoothing, and a 5 kHz bandwidth below 500 Hz, and 25 kHz bandwidth above 500 Hz. 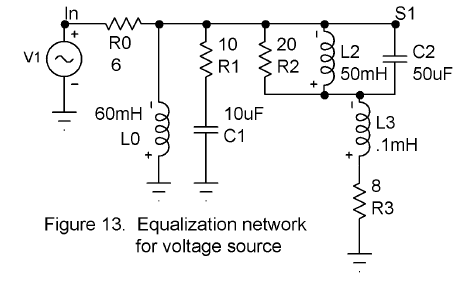 This raises the question of whether passive equalization with a voltage source would be better yet, but I did not explore this at any length. I did, however, work up a simulation of what such a circuit might want to look like, and came up with Figure 13, where the voltage response across the driver is very similar to that of Figure 11. 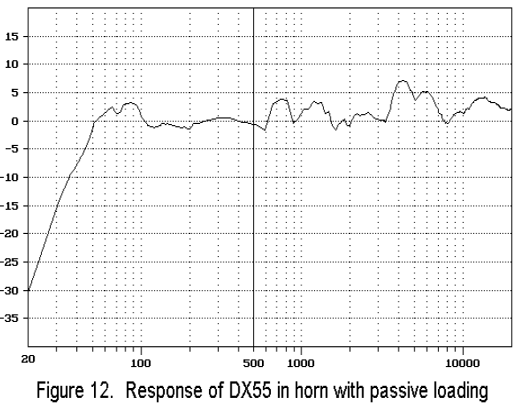 If you happen to build a horn like this and use a DX55, I suggest it as a good starting point. There are time delay issues that appear when you back-load a driver, particularly when you use a long horn. If you are not simultaneously using the front wave, some of these can be addressed with digital delays and/or placement to minimize the effect. In the Kleinhorn there is substantial delay on the rear wave due to the length. This can be reduced by shortening the length and using a larger throat, but this would be appropriate for larger drivers such as the 8 inch Lowther DX4 and its cousins and the Fostex FE206E and its relatives. In any case, this would only remove a couple of feet or so. The larger question is, how audible is this delay? My experience with this horn leads me to believe that it's not nearly as audible as you would expect. You can detect it on certain passages, but it's not particularly problematic and I don't find that it interferes with the overall enjoyment of the sound. I find that I would rather have a bottom end with a wavelength of delay than no bottom end, but part of the key to making this work is to carefully choose the driver box size, stuffing, and surface damping to filter the higher frequencies out of the horn response. Like most of the rest of the decisions on this project, this is best done through experimentation and judged by a combination of listening and measuring. So how do they sound? Big. Very Big. The articulation and detail of the DX55's have made them my current favorite in this category, but while you can coax some low end out of them in a conventional box, at reasonable levels the cone excursion introduces enough intermodulation distortion that it hides these qualities. A big rear loaded horn is intended to alleviate this problem. I have been extremely pleased at the results, but I have to smile when I see that all this effort barely gets us below 50 Hz. Still, they play loud cleanly in a manner that Lowther owners don’t usually encounter, and the cones are barely moving. 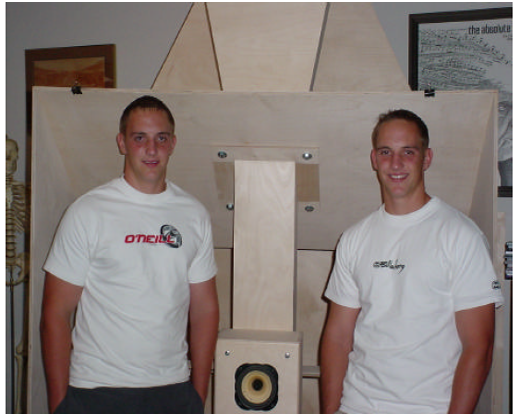 Chris and Matt learned a lot about wood working a speaker building this summer, and we all had a lot of fun. Here is their picture. In addition to Chris and Matt I want to thank Desmond Harrington and Kent English, all a pleasure to work with. But Wait! There's More! In part 2, we will extend the low frequency response below 20 Hz by mating the Kleinhorn with El Pipe-O, plus some other goodies.